EarthSummit2012Japan is a non-profit multi-stakeholder organization that provides policy proposals, civil actions, and inclusive platforms for the process leading up to Rio+20 in Japan. It was established in August 2010 and consists of about 50 staff members from different sectors such as government, NGOs, social enterprises, academics, and students. 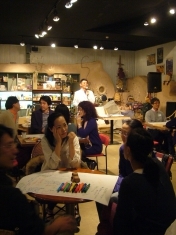 EarthSummit2012Japan is carrying on its activities in partnership with various organizations or individuals in Japan. We are making policy proposals to the government including the establishment of the “Domestic Preparatory Committee for Rio+20,” which was established in July 2011 and is ensuring a multi-stakeholder participation to the process. We also coordinate a cross-sectional network of NGOs called the “Rio+20 NGO Network.” Furthermore, we contribute the awareness raising of citizens or companies through a variety of events or timely information concerning Rio+20 in cooperation with various media and academic community. 地球サミット2012 Japan --EarthSummit2012 Japan-- since 2010-10-22 / Copyright 2010 地球サミット2012 Japan. All Rights Reserved.